†Syndus, Herluin Lothaire, Arnskar Ember-Master, and Vanryth Gatharian are vendors added (in that order) during Under New Management. ‡Only appears during A Cornered Rat if left alive during Diplomatic Immunity. *Relocates to the cistern or elsewhere after related quest(s). DGAdded by the Dawnguard official plug-in. Enables you to change your character's appearance. There are cupboards, barrels, sacks and crates all around the room, as well as the counter in front of the east wall. The innkeeper, Vekel the Man, is found standing behind the counter or sweeping the floor. When first reaching the inn, you will find Dirge, the inn's bouncer, talking to Brynjolf by the counter. Dirge will soon return to his usual position on the far side of the bridge, beside the inn's sign. On the counter are a few bottles of Nord mead, an apple pie, a baked potato, and a loaf of bread. On the tables are loaves of bread, with one of them also having a horker loaf, bottle of alto wine, bread and cheese on top. Delvin Mallory, who is usually found in the Ragged Flagon, is normally at this table. Behind the counter is a simple, but deep fireplace, with more shelves and cupboards against the far wall. Behind one of the cupboards is a set of shelves holding more bottles of alto wine, wine, and Nord mead, with a couple of common books on top. In the southeastern corner is a wooden door that leads into the Ratway Vaults, with a storage cabinet on the right that requires a key to open. This will be unlocked by Brynjolf at the end of Taking Care of Business when he will lead you to the Ragged Flagon - Cistern to introduce you to Mercer Frey and welcome you into the Thieves Guild. During the A Cornered Rat quest you will find Gissur sitting and drinking at the first table of the inn or following you around the room, unless he was killed during the Diplomatic Immunity quest. He will try and leave once you receive the information regarding Esbern, however Vekel will suddenly announce, "That one, right there, walking out the door! He was one of them asking about that old man you were looking for." If confronted, Gissur will only rebuff your attempts at conversation. However, he can be attacked and killed with no repercussions, and other Thieves Guild members will join the fight on your side. 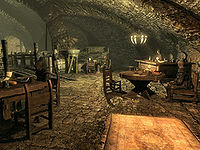 As you complete the Thieves Guild reputation quests, new shopkeepers will move into the alcoves to either side of the doorway leading from the Ratway. Once you have completed all four of the special reputation jobs for Delvin, the main furniture within the inn will be improved to better quality replacements. Syndus' shop is opened after completing the first reputation quest (see here for his standard merchandise). None of the displayed merchandise can be purchased, only stolen. It is located in the first alcove on the right when entering from the Ratway and contains a counter, three archery targets, several crates, a rack hanging from the ceiling and a chair that he seems to spend most of his time sitting in. The items on display include a random enchanted bow and loaf of bread on the counter top. On the ledge that runs around the lower part of the wall, to the northwest is a leveled bow, a medium coin purse and bunch of lavender, to the southwest, behind the targets is a long bow and to the southeast are two bottles of alto wine, two bottles of wine and a sheaf of wheat. On the ground beside his chair are a lute and drum, while hanging from the rack is a rabbit, two pheasants, a bunch of dried frost mirriam and a garlic braid. The Ragged Flagon also appears in Legends, having been added with the Return to Clockwork City storyline. This page was last modified on 17 March 2019, at 16:40.